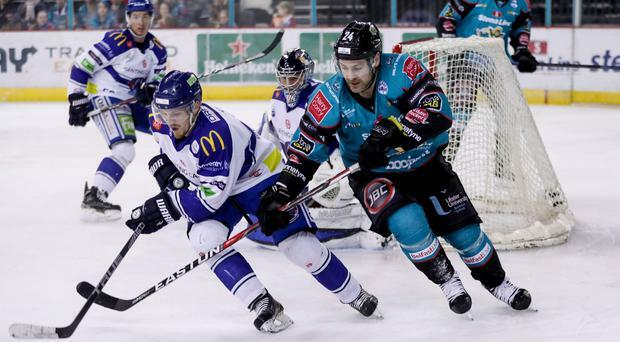 The fear was how the Belfast Giants would react to their Challenge Cup win a week ago, and for a long time there was plenty of worry it might go the wrong way. It wasn't the most convincing of performances, and it was only in the last minute that the hosts made the result secure with late empty net goals from Jordan Smotherman and Kyle Baun to add some gloss to the scoreline. The night began with the Giants parading the Challenge Cup trophy out on the ice before face-off, and it was somewhat appropriate that captain Blair Riley, who carried the Cup out, was the one who put them ahead before Darcy Murphy got the game-winner late in the first. After the final 23 seconds of the first period were delayed to the start of the second period due to a broken panel around the rink, Murphy scored with just seven seconds after the restart, the winger firing on Matt Hackett in the Blaze net and picking up on his own rebound to deposit what would prove to be the decider. The Giants' rode an outstanding penalty kill to victory, the league's leading special teams unit going 6-for-6 in an ill-disciplined performance, highlighted from the off as they played out a 1:50 five-on-three after just 2:14 of the first. It was how the hosts took the lead at 14:19 of the first with Colin Shields in the box for a tripping call, Riley effecting the turnover in the neutral zone and going on the shorthanded breakaway, maintaining his composure to finish five hole on Hackett - who made 34 saves on 36 shots. The Blaze had no shortage of chances to tie it after Tim Crowder pulled it back to a one-goal game at 6:53 of the second, with the best chances falling to Ross Venus, however they couldn't beat Murphy in the Giants goal - 22 saves on 23 shots - allowing Smotherman and Baun to wrap up the result. With the win, the Giants move two points behind the Cardiff Devils at the top of the Elite League standings, albeit having played a game more, and keep the pressure on the league leaders ahead of a tough weekend for the defending champions. Coventry had pulled it back to a one-goal game when Tim Crowder's weak backhanded effort sneaked through Stephen Murphy's pads at 6:53 of the second, the only fault on the Belfast netminder who was standing in for the unavailable Tyler Beskorowany. It was a game of inches, however, with both sides seeing plenty of opportunities ring the iron. For the Giants, Curtis Leonard and Darcy Murphy both saw shots hit the frame, while Luke Ferrara pinged the pipes at the other end for Coventry. But the Giants were indebted to goaltender Murphy, who laid out for some incredible stops late in the third period to maintain the one-goal lead, denying Venus twice in quick succession before stopping Ben Lake as the visitors pressed late on. The two sides meet again tomorrow night (face-off 7pm) in the second game of their double-header at the SSE Arena.